The main parameter determining the result of humidity content in a tested sample is the drying temperature. Placing the control thermometer directly above the drying pan enables reading the temperature close to the one of the tested sample. Thus, the adjustment is carried out in actual thermal conditions occurring on a typical analysis. A moisture analyzer adjusted using the control thermometer CTK 01 series operates precisely and with the highest accuracy. 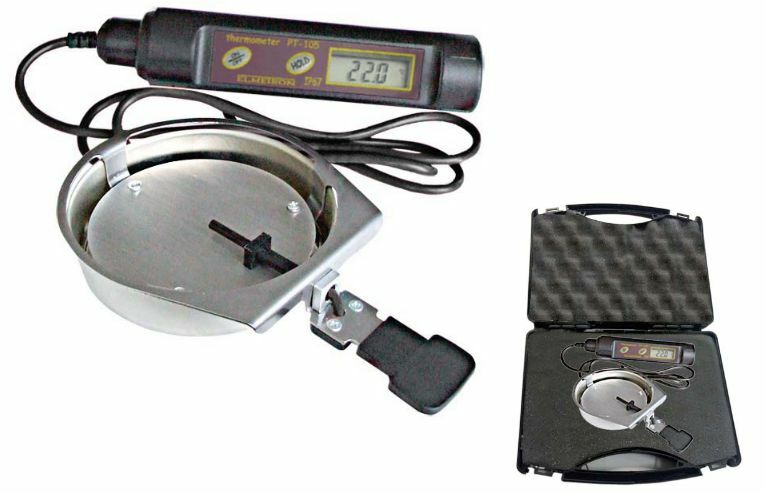 The control thermometer is intended to checking whether the temperature on the drying chamber complies with the temperature value indicated on moisture analyzer’s display. The CTK 0.1 features fully waterproof housing protecting the device against moistness. The thermometer structure ensures conditions fully imitating the conditions present on the drying pan during a drying process of a sample. Automatic switch off preventing accidental discharging of batteries. HOLD function (lock of displayed value). Power supply by batteries 3x1.5V. CE marking.